The Morrison Family Education and Outreach Pavilion received a 2015 Citation Award from the American Institute of Architects (AIA) Indiana. Constructed in October 2014, the pavilion marks the inaugural building at Notre Dame’s Linked Experimental Ecosystem Facility (ND-LEEF), and the first University structure to receive a commendation from AIA Indiana Design Awards. The Pavilion also received “High Commendation” for Excellence in Design in Community Engagement from the International Network of Traditional Architecture and Urbanism at their World Congress event in London last spring. The Mid-west Chapter of the Institute of Classical Architecture and Classical America will recognize the Pavilion with an Acanthus Award in November. Buccellato designed the Pavilion using traditional timber framing construction methods. The timber for the frame, mostly native white and Bur oak, was felled in western Illinois then transported for milling and fabrication before the live-build raising event last fall. The Morrison Pavilion includes a touch screen display, showcasing the research underway at ND-LEEF to visitors as well as the story about the design and construction of the distinctive Pavilion. The interactive multimedia component will soon be powered by solar cells mounted to the roof of the Pavilion. Part of the Notre Dame Environmental Change Initiative, ND-LEEF is a globally unique research facility with two replicated watersheds and linked streams, ponds, and wetlands. The 29-acre site was designed to bridge the controlled environment of a laboratory with the uncontrolled environment found in nature. 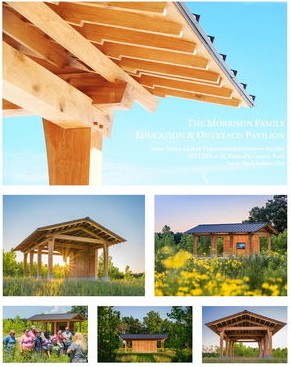 As the centerpiece of ND-LEEF, the Morrison Family Education and Outreach Pavilion offers a year-round outdoor classroom and outreach destination located 5 miles from campus at St. Patrick’s County Park. The Pavilion serves as a platform for the public, University visitors, and academic peers to learn of the cutting-edge research being conducted by scientists, and acts as the critical gateway between the classroom and the field for educators and students of all ages. A special thank you to the University Architect’s Office, specifically Doug Marsh and Tony Polotto for supporting the ND-LEEF project. Originally published by Alex Gumm at environmentalchange.nd.edu on October 27, 2015.